4 out of 5 Godzilla-sized majorettes agree that the monthly Georgetown Art Attack art walk is worth the foot traffic of our marching band-friendly Airport Way S strip. The fifth majorette, well, let’s just say she marches to the sound of another, less funky drummer. • American Pie and Bakery presents “Divination’s of a Graceless Heart”, a sculptural show of phantasmical work by Matthew Hinshaw. • Calamity Jane’s presents “Fathers, Models,Gods”, a solo show of iconic poppy work by Rich Hall. Syd Shera, ceramic art: Syd will be letting people roll clay slabs on a large slab roller and stamping them with intricate stamps. M. Anne Sweet, poet/mixed media artist: Anne will be showing rarely seen works by the late artist Chuck Smart. Tabasco the Blacksmith: is currently working on a large project for Burning Man 2013 entitled “The Guardian of Dawn”. Karl Seng, lampmaker extraordinaire: open studio! See Karl’s found object lamps. 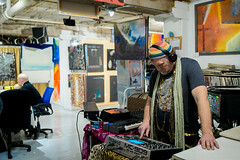 Steve Hussey, of Burning Specialties (Steel): Steve will be in his shop, working on his Left Brain series. John Kirschenbaum, woodworker: “Will. Yes”. Derek Voss, welder and sculptor: Derek will be cleaning his studio and will be ready to be interrupted at any time by your questions. Trevor Gauntlett, Metal Sculptor and Photographer: unique steel frames, lovely photos of his travels, giant water fountain. Jeff Olhoeft, stonecarver: Stop by and see what Jeff is hammering away at. 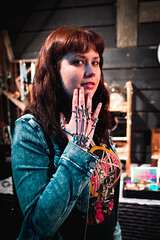 Sophia Wheelwright, collagist , collaborationist and bricoleur: Come see the super cool wavy screen thing she’s got going. And the slide show of old family photos superimposed over Brancusi shaped wood pieces. Sarah Woodsen of Downing Pottery: Sarah, the one-woman mug factory, will show us what success looks like. Michelle Smith-Lewis, (photography): will be showing a large group of Kozo prints from her Fire Series. Dan Morgan + Joel Kikuchi, woodworkers: Dan and Joel show off their new giant saw and an even more giant sander. Alair Wells, blacksmith: Alair will be demonstrating her forging techniques at her red hot forge. Garth L’Esperance, Colin Stevens, Mike Nazaroff, machine bike shop gizmo makers: If you’re lucky, someone will demonstrate the bike powered cuisinart: fabricated for kids at the zoo to macerate elephant dung to make paper with. Patrick Nelson + James Ryan, metal sculptors: they are welding clangers and bangers for our booth at the Georgetown Carnival on June 8. • Fantagraphics Bookstore & Gallery presents “Guy Peellaert: The Adventures of Jodelle and Fragments of the Pop Years”. Music by K recording artist Angelo Spencer. • The Georgetown Arts & Cultural Center hosts “Saints, Sinners and Sith”, recent Star Wars/tarot themed works by Zeuf of Omakase Images. Artist talks about his work at 7 pm. 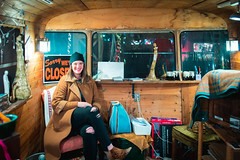 • The Georgetown Liquor Company will continue the display of old school tattoo flash designs by Jacob Cass and oil paintings of exotic birds by Kat Houseman. 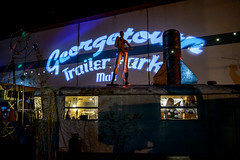 • Georgetown Trailer Park Mall Georgetown Trailer Park Mall Dance Party: Get Your Grooves & Funky Moves on with Georgetown’s Finest DJ Trio! Find Your Soul at Modern Mystics, Frida Gallery, Make Believe, Beaver’s Den Vintage, Clocharde & Tic Tac Vintage! • Krab Jab Studio presents “The Art of Samuel Araya”, a series of dark, mysterious digital and mixed media paintings. • LxWxH Gallery presents “The City and the City” co-curated with Daniel Glendening with Samantha Wall, Lisa Radon, Zachary Davis, Jason Lee Starin, Laura Hughes, Patrick Kelly, Evan La Londe, Sean Joseph Patrick Carney, Chase Biado, Rebecca Steele, and Lydia Rosenberg. • Le OBJECTS for The Home is featuring artist Lisa DeFaccio showing her Unique Handbuilt Ceramics. • Miller School of Art hosts a $20-40 art sale, where all proceeds go to benefit summer animation/Kung Fu students of low income. • Nautilus Studio has reopened, and is showing the latest dark, naturalist/realist oil paintings of Jethaniel Peterka and Kyle Abernethy. • NuPasa Gallery hosts ”Art by Children.”, a group show of art by children ages 4 to 12, as well as featuring Tina Routt.